It started for me back around 1960 when as a spotty 14 year old schoolboy I was interested in computers. Now this was a silly thing to be interested in because no 'normal' person had ever even seen a computer. They were massive things used by banks and insurance companies to calculate payrolls etc. and at 14 my chances of learning how they worked or even seeing one was about nil. But I borrowed a book on Fortran programming and taught myself to write programs, the only problem was I didn't have access to a computer and I had no idea how to get the program from my piece of paper into the machine. I imagined a slot in the front where I sort of posted my program and that was about the limit of my understanding of computer hardware. 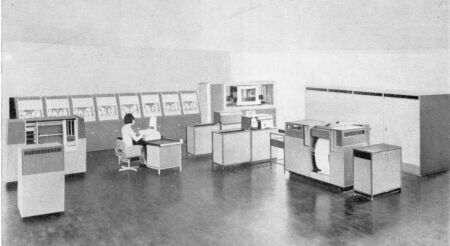 In the late 60's after working in electronic switching I actually started working with computers and knew I wanted to own one myself. A typical 'small' 1960's computer system, not something most people wanted to have in their living rooms!!!! Not even Julie!!! But wanting my own computer was something I mostly kept to myself as it wasn't as it is today that everyone uses a computer. Back then no-one could see any sense in it and even (especially) people working in the computer industry thought I was bonkers (Julie says she still does!). The typical comment was 'what do you want a computer for'. They were of course still large, expensive and used, yes you've guessed it for doing payroll calculations.